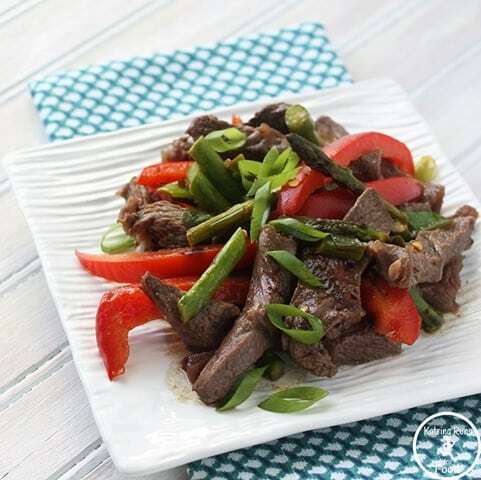 What is it about a simple cut of beef stir fried with fresh vegetables? I could eat beef 10 different ways in one week and not get tired of it. I had a fridge full of leftover scraps of vegetables and I knew I wanted to make something with beef. 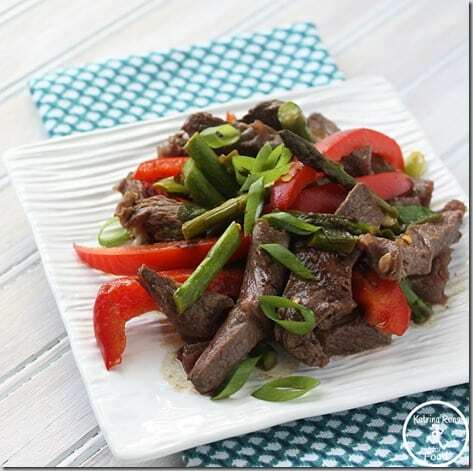 This Steak and Asparagus Stir Fry from Cooking Light was a perfect fit. Heat a large skillet over high heat. Add 1 tablespoon oil to pan; swirl to coat. Add beef; stir-fry until browned but not cooked through (about 1 1/2 minutes). Place beef on a plate; discard liquid in pan. Return pan to high heat. Add remaining 2 teaspoons oil; swirl to coat. Add asparagus and bell pepper; stir-fry 2 minutes. Add crushed red pepper and green onions; stir-fry 30 seconds. Reduce heat to medium-high. Add stock mixture; cook 3 minutes or until sauce is slightly thickened. Return beef and any juices to pan, and cook for 1 minute. This was also delicious the next day for lunch. And there are other vegetables that could be added depending on what you have on hand. 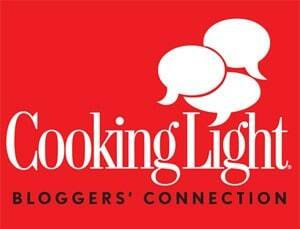 Keep the pieces of similar size and adjust cooking times if needed. This post is on behalf of Cooking Light Bloggers’ Connection.